There are two kinds of people who go to Chinese restaurants. Some won’t be happy unless the food is authentic, the very dishes you’ll find in China. 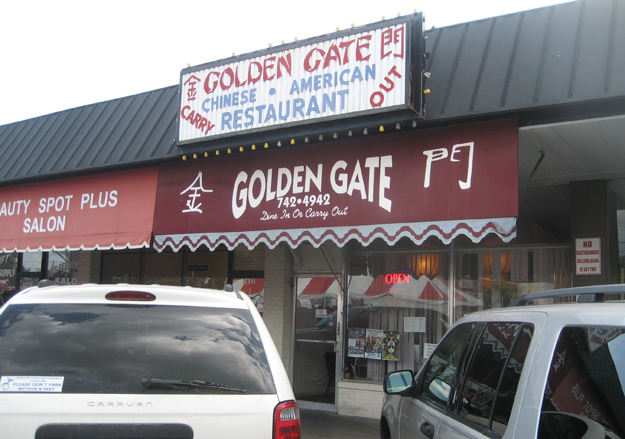 And the other kind replies, “who cares if the food is authentic as long as it’s good?” The food at Golden Gate is very very good. I wish I’d found it sooner. Don’t let the dumpy exterior deter you. Ask any New Yorker of a certain age about childhood and Chinatown, and chances are they’ll have a lot to tell. About weekend outings with mom and pop and the rest of the family to the color and clamor of Chinatown — for a little boy, as foreign and strange as you can imagine. 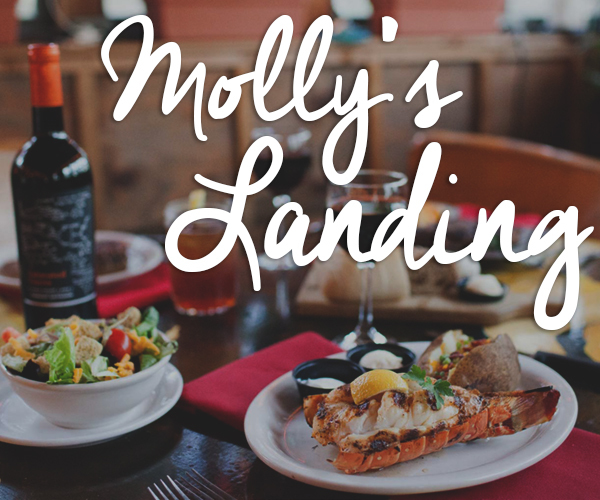 About dinner at their favorite restaurant, thick meaty egg rolls followed by a parade of impossibly exotic dishes like sweet and sour pork, dishes full of pineapple and gooey sauces. But when these New Yorkers try to find this restaurant again, they can’t. It’s gone forever. There are New Yorkers living in Los Angeles, where you’ll find perhaps the most authentic Chinese dining outside of China, and they spend their time asking people where to find those New York egg rolls. For them, it’s a Proustian gateway to their childhood. If they only knew, they’d get on a plane to Tulsa and head for Golden Gate. Thick, with crisp outside and delicious crunchy minced filling, these are a New Yorker’s dream. (Though, if you look into the clean but very cramped kitchen, you’ll find Mexicans making them.) As we were eating them, our first dish arrived. Golden Beef with Tomatoes ($13). 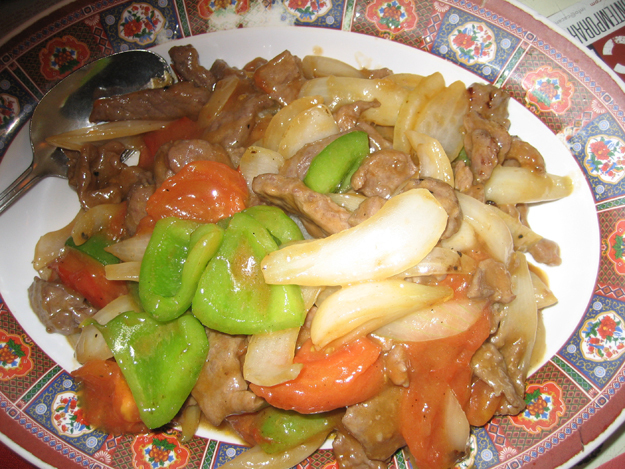 Tender marinated beef mixed with tomatoes, green peppers and onions. Whoever made this has talent… or “good wok air”, as Chinese call it. Everything cooked just right, not too much sauce (hardly any at all), delicious. 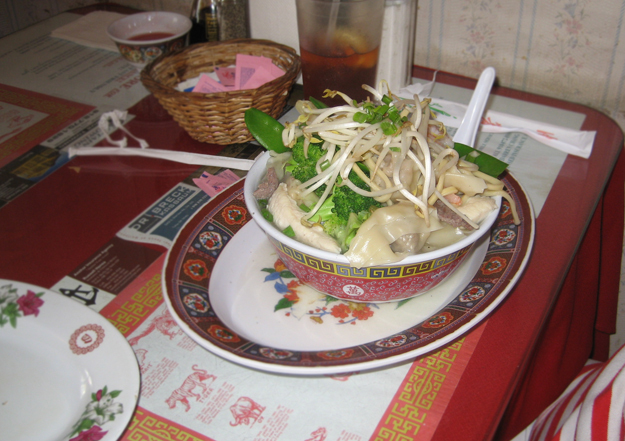 And yes you can find stir-fries like this in Guangdong, China, and you’d be glad to get them. Then came Garlic Shrimp ($10). 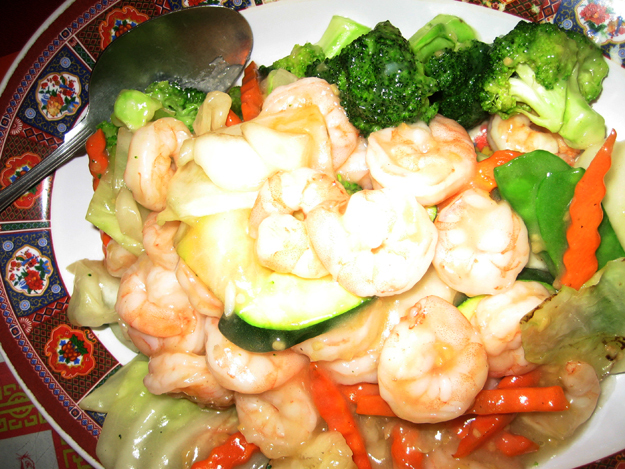 Tasty shrimp, delicious vegetables, a healthy dollop of garlic and sesame oil made this dish another winner. But it was upstaged by the General Tso’s Chicken ($12). 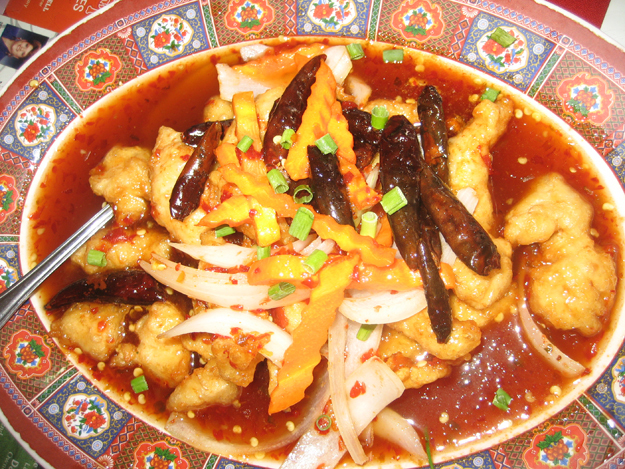 General Tso’s Chicken was invented around 1972 in New York City by a chef who had come from Taiwan. It’s inspired by the food of Hunan in central China. It thus has no connection at all to the American-Cantonese tradition of Golden Gate. 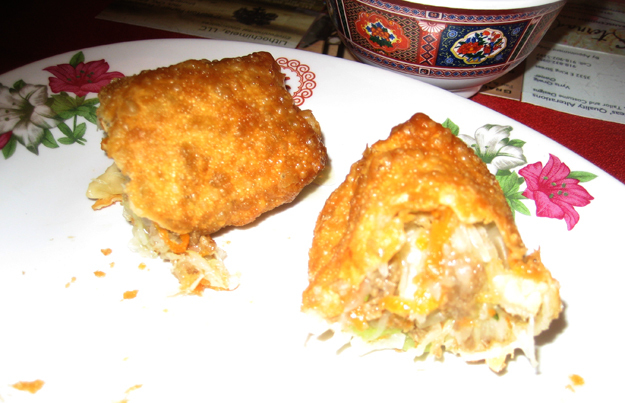 Most Cantonese restaurants take this as a license to serve bad food, and they will offer you a goopy, insipid version. But Golden Gate takes it as license to be creative. 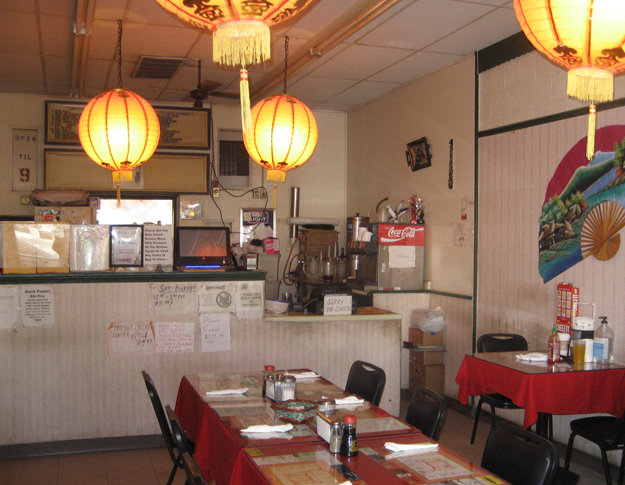 Their General Tso’s is unlike anything you’ll find anywhere else. They reinvented the dish and it was wonderful. The chicken pieces are thinly battered and delicious, the sauce is sweet but not cloyingly so and with hints of spice, and those hot chilis are really hot. As we ate, the place filled up. The people were happy (just like those old New York places) and the waiter was very friendly and knew them all (unlike most of those old New York places). “Hey you must try this soup!” a woman at the next table called to me. On my next visit I think I will.